In a world where screens often run our lives, it’s easy to forget the importance of getting up and moving. Checking in on your wellness doesn’t have to be a chore—all it takes is 20-30 minutes of walking a day to improve your mental and physical health, and it’s the best (and easiest) form of exercise to implement into your daily routine. Beyond the obvious boost to your metabolism and potential for weight loss, the list of benefits to your health from walking extends to areas of which you might not even be aware. Elevate mood and productivity – A simple walk is proven to elevate a person’s mood. Walking, especially outdoors, decreases anger and hostility and alleviates stress and depression. Even those who suffer from clinical depression have seen improvements from walking without use of medication. Even if you’re not having a bad day, daily walks also boost creativity and productivity. Taking regular walks means you have an established routine, which results in increased likelihood to continue the activity, as well as the inclination to adopt even more healthy habits and a more productive day overall. Decrease risk of disease – Walking can dramatically decrease your risk for diseases, whether it be a chronic disease or the common cold. Daily walks lower your blood sugar and blood pressure, decreasing the overall risk for diabetes or a stroke. Regular walking also lowers your chance of cardiovascular disease by 30% compared to those who don’t walk regularly. It even reduces the risk of breast cancer, daily illnesses and some chronic diseases. Walking improves your immune system significantly shortening the length of illness or preventing it entirely. Enhance brain power – Walking is just as beneficial to your mental health as it is your physical health. Walking daily increases the flow of blood to your brain, thereby helping to improve memory, cognition, and learning/reading comprehension. Additionally, regular walks improve quality of sleep, cutting down on stress and anxiety on a daily basis, which is critical for mental health. Already take regular walks? – If walking is already a part of your daily routine, try taking an extra step with “earthing.” Walking barefoot on the natural ground (grass, sand, dirt, or rock) can boost the benefits you already get from a daily walk. When walking barefoot on natural surfaces, the electrons from the Earth are absorbed by your body. These electrons are like a natural antioxidant. 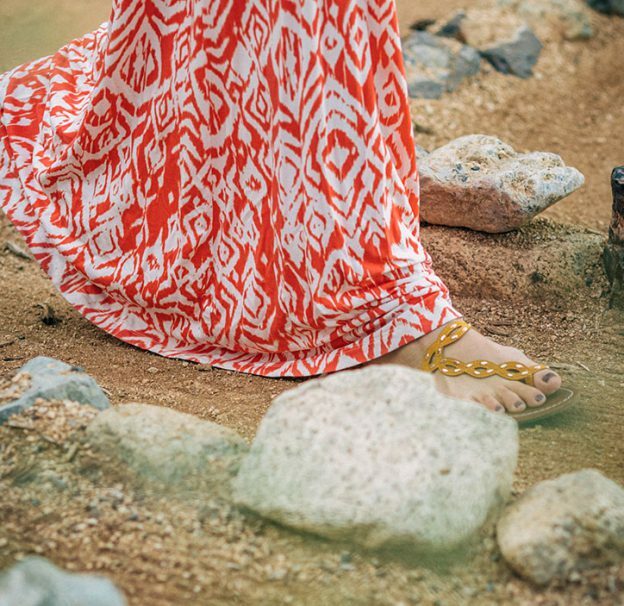 “Earthing” can reduce inflammation and chronic pain, regulate hormones, and normalize your body’s biological rhythms. It has even been shown to have anti-aging properties! “Earthing” also encourages exposure outdoors and in the sunshine, which is another great way to improve your mood and fend off Seasonal Affective Disorder (SAD). On your next visit to Glen Ivy Hot Springs, incorporate the physical and mental benefits of walking the Labyrinth into your day of wellness. Featuring only one path to the center, and back out again, the twists and turns of a Labyrinth’s path symbolize a journey to a predetermined destination; and similar to our journey in life, the path may not be clear at first but will always lead us to our destination. When entering the Labyrinth, clear your mind and walk calmly through. The slow, intentional walk allows for head space to focus and reflect in the midst of every day stresses and the busy lives that we lead.